Ak Bars is just one step away from claiming its third Gagarin Cup following a 3-1 victory in Moscow. Two goals from Anton Lander and two points from Justin Azevedo led the way as the Kazan team claimed a 3-1 verdict on Friday night. Emil Garipov also impressed, making 40 saves as another fine display of counter-attacking hockey secured a vital win for Zinetula Bilyaletdinov’s men. The team news wasn’t encouraging for CSKA, with forward Valery Nichushkin missing out while Ak Bars’ defenseman Vasily Tokranov returned to the visitor’s roster. But the early exchanges suggested that the Army Men were ready to build on Wednesday’s overtime win and battle right back into this series. After an early scare when Jiri Sekac sent the puck behind goalie Ilya Sorokin, only to see it float wide of the far post, the home team took the first-period initiative. Andrei Svetlakov thought he’d opened the scoring in the 12th minute when he swooped to stuff the puck home after Ivan Telegin carved out a chance on the wraparound. The video review, however, found that Ak Bars goalie Emil Garipov had got his glove on top of the disk before the CSKA man got a stick to it; no goal. Almost immediately, though, CSKA got the chance to maintain that pressure on the power play, and Geoff Platt found himself well-placed in front of Garipov’s net but unable to beat the goalie. Then came the counter punch. Ak Bars had created little but snatched the lead a minute before the intermission. Two passes, Atte Ohtamaa to Artyom Lukoyanov, then Lukoyanov to Azevedo, sprang a counter attack for the visitor; Azevedo, the leading scorer in post-season, was not about to spurn the chance for a characteristic finish from just inside the left-hand circle. Azevedo was involved again early in the second as Ak Bars doubled its lead. This time he emerged from behind the net to provide the feed for Lander to make it 2-0. But CSKA hit back immediately when Svetlakov scored 15 seconds later. Andrei Kuzmenko brought play into the Ak Bars zone, Telegin shot from the point and Svetlakov was on hand to gobble up a big rebound and put his team right back in the game. Home hopes of tying the game up were hampered by a penalty on Mikhail Naumenkov and the next big chance of the game fell to Ak Bars. A defensive mix-up sent Stanislav Galimov clean through on Sorokin’s net but the forward, in form earlier in the series, allowed the puck to get away from him and the chance went begging. The third period followed a pattern seen frequently in this series. 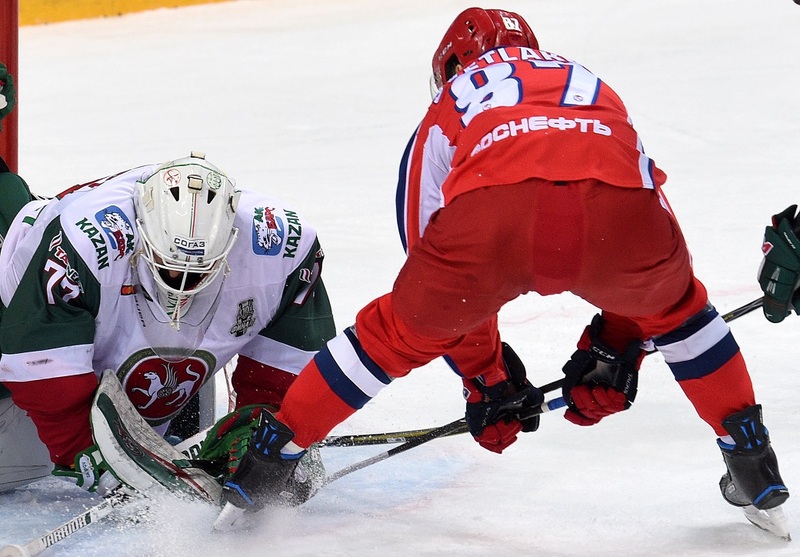 Ak Bars was content to cede much of the initiative to CSKA, relying on its powerful defense to close out the win. Once again, the tactic worked. There was an early scare on the penalty kill when Mikhail Grigorenko’s shot might have dropped kindly for either Kirill Kaprizov or Maxim Shalunov, but for much of the play Ak Bars was fairly comfortable. A spell of more than seven minutes without a whistle played into the visitor’s hands as the clock ran down with both sets of fans biting their nails. Finally, Lander put his second into the empty net in unusual style: hacking the puck clear from behind his own goal line, he watched as the disk rolled on its side up the ice, following a curved trajectory reminiscent of a curling stone as it just beat Mat Robinson’s despairing dive and hit the back of the net. Ak Bars could secure the title on home ice this Sunday when the teams go back to Tatarstan for game five of the series; CSKA must win to retain its hopes of lifting the cup for the first time.